Time for another favorite recipe. Courtesy of (surprise) Heidi Swanson’s 101cookbooks.com. I made this the other night for a semi-potluck, and as usual,* it was a hit. 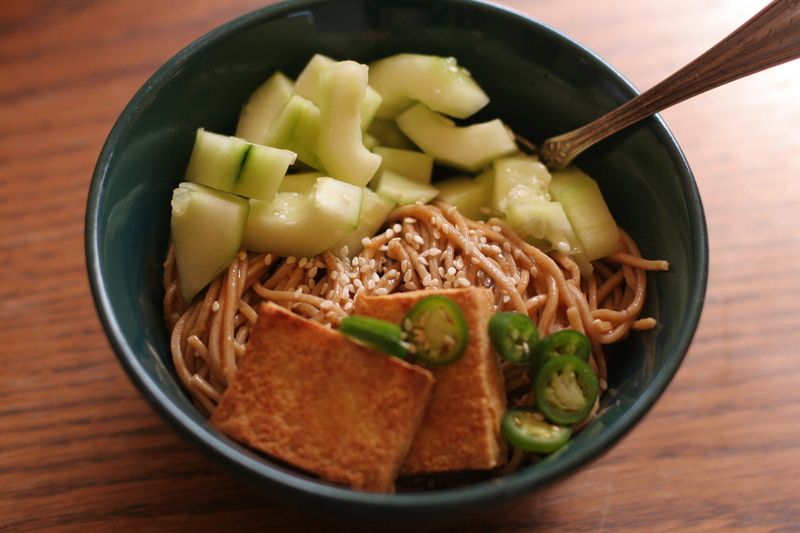 Sesame-ginger-honey-lemon-cayenne dressing over buckwheat soba noodles, diced cucumbers, and pan-fried tofu, finished with sesame seeds and with green onions and cilantro, if I’ve got ’em on hand. I could eat this every day for a week, people. Well, that’s true about a lot of foods. But this one especially. *One fairly disastrous exception was the time I tried to make it for my wonderful CouchSurfing hosts in Barcelona. The effort was doomed by my inability to find Japanese ingredients in Catalunyan grocery stores. The result was a brownish, ginger-less spaghetti slop with rock-hard tofu nuggets. Pretty humiliating. But they were totally sweet about it, bless their hearts. Maybe someday they’ll visit me in San Francisco and I can redeem myself with a proper version.